People use words to communicate what they think, feel and believe. But for social psychologists, words can do far more than convey one’s thoughts and emotions. The right combination of words can boost persuasiveness; it can forecast which ads will prompt people to share them and thus go viral. Exposure to the right kinds of words also can spur behavioral changes; word choices can encourage readers to keep perusing long-form content. Words can even predict how well a business could do. At the second annual Behavioral Insights from Text Conference held recently at Wharton, academics from various disciplines came together to share their research on text analysis using natural language processing and related tools. Several of the studies shared a common trait: persuasiveness. Whether it is prompting someone to adopt a pet, click on an online dating profile, share content on social media or keep reading a long blog, choosing the right words can make one more persuasive. There are two routes people take to persuade, according to David Markowitz, assistant professor of social media data analytics at the University of Oregon. One is the “central route” where people communicate the main purpose of their appeal. This goes to the heart of the message. For example, when a bank customer applies for a home equity loan, he or she can convey to the lender that the funds will be used for a kitchen remodeling. Here, more information is better. “The more words you actually provide in your piece of text, the more likely that persuasion is going to occur,” Markowitz said. The writing style also has an important impact on persuasion. Text that is written more concretely is more persuasive, he added – that is, using words that can be observed by the senses, such as things, places and people, compared to abstract terms such as justice or peace. The second route of persuasion is “peripheral.” Words that exist on the sidelines of the central message — such as social references like ‘best friend’ or adding descriptions including color or shape — are peripheral, Markowitz said. Such words are added to the main message usually in the belief that it would boost persuasiveness. Instead, his research showed that it could backfire. “These can actually undermine persuasion,” Markowitz said. Markowitz and his colleagues studied the impact of central and peripheral routes on pet adoption. 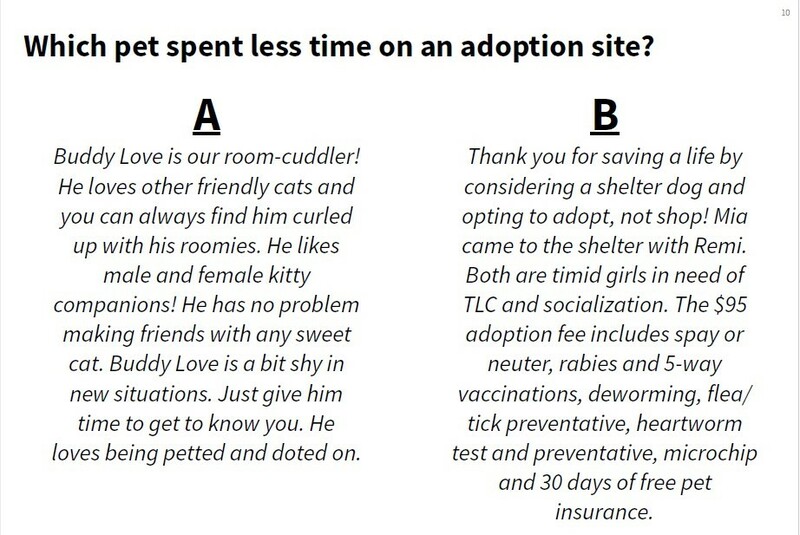 They analyzed more than 200,000 pet profiles on Petfinder.com to see how long it would take for pets to get adopted. Duration ranged from one day to several years for bigger animals such as horses. The study compared two kinds of pet profiles: warm and fuzzy (more peripheral) and factual (more central). Which profile was more effective? Even though the warm and fuzzy pet profile (A) tugged at the heart strings, it was the factual profile (B) that led to faster adoption, Markowitz said. One possible explanation is potential pet parents would rather assess the animal in person. They’re thinking, “I will be the judge if the pet is right for me,” he said. So they prefer a pet’s factual information in the profile. Markowitz added that posting more photos can hurt the listing, too. “The more times you use social references and the more photos in a profile, the less likely the pet will have a short duration on a site.” He added that this finding is consistent with his prior work in online dating: Posting more photos led to fewer clicks. Laura Gibson, a research director at the University of Pennsylvania, and her colleagues looked at another impact of language: Can it make people stop — or be less likely to start — smoking? They conducted a five-year study of textual content from traditional media (wire service, major newspapers, broadcast news and popular websites), social media (Facebook, Twitter), tobacco ads on YouTube and entertainment on TV. They parsed through more than 22,000 long-form texts, 58.6 million tweets and nearly 3,100 YouTube videos with at least 10,000 views — looking at the tags, description and titles but not images. The researchers paired the text with a three-year, national telephone survey of about 12,000 people aged 13 to 25, of which 11,000 were non-smokers, contacting them by cell phone or landline phone. What Gibson and her team found was that these anti-tobacco campaigns do work. “The more anti-tobacco coverage you’re exposed to, the less intention to smoke you’ll have,” she said. “It’s a bit larger effect for smokers” who said they’ll try to quit. In general, it didn’t matter which media format was used for the anti-tobacco campaign. “We saw consistency across traditional media sources and popular websites and Twitter for anti-tobacco coverage,” Gibson noted. Even though many websites and Twitter typically do not have a team of editors actively shaping and choosing content, their anti-tobacco messages had the same impact. However, YouTube exhibited another pattern altogether because it had many more pro-tobacco ads compared to other media. In this study, the team did not include pro-tobacco ads nor usage of e-cigarettes, which could be subjects for future studies. What Makes YouTube Ads Go Viral? Companies post ads on YouTube to increase brand exposure to the public. But most ads turn out to be duds and few go viral, according to Gerard Tellis, professor of marketing, management and organization at the University of Southern California. He pointed to the success of an old Budweiser Super Bowl ad called “Puppy Love” about a bond that develops between a puppy and a Clydesdale horse, which the public voted as the best of all time on USA Today’s Ad Meter popularity contest in January 2018. The ad, which has been shared millions of times, tells the story of a puppy and a horse that become best buddies. When the dog is taken away and is separated from the Clydesdale, the horse takes chase. The two reunite in adorable fashion. “There’s character and plot and tension and a happy ending,” Tellis said. So how can marketers develop a similarly viral ad that would drive shares? What are the secret ingredients? To answer these question, Tellis and his colleagues analyzed thousands of video ads uploaded by companies to YouTube. The ads were rated based on more than 60 factual (new product, ad length) and emotional (funny, surprising, suspenseful) traits. They used people rather than artificial intelligence to rate the ads because there are too many categories for AI to do a proper job, he said. What they found was that emotions have a “strong positive effect,” Tellis said. That means the more emotional the ad, the more likely it is to be shared. Key drivers of emotion are drama, plot and character. Also, ads featuring babies and animals are more likely to be shared compared with celebrity endorsements, he said. Funny or surprising ads also get people to share them. Emotional ads work for YouTube, Twitter and Facebook. For marketers who want to create viral ads, the key is to create emotional commercials rather than factual ones. If the ad is more “informational” or factual in nature, it is less likely to be shared, Tellis noted. But there are exceptions. If the ad features, for example, a new product or high-priced goods that could benefit from explanation, a factual commercial is more effective. Also, information ads work better on LinkedIn than other social media. Another finding is that the more a company’s brand appears in the ad, the less likely it will be shared. Moreover, viewing peaks at the one minute mark. For marketers who want to create viral ads, the key is to create emotional commercials rather than factual ones, Tellis said. Feature babies and animals rather than celebrities. Use humor and the element of surprise. Place the brand at the end of the ad and keep the ad between one to 1.5 minutes long. In practice, marketers are way off the mark. Tellis said that 55% of ads are more factual than emotional. Only 3% feature cute kids and pets in their ads while 36% sign up celebrities. Also, only 28% make the ads funny and 10% insert surprising content. As for brand exposure, only a third of companies put their logos at the end of the ad. And half of ads run less than one minute long and a quarter run more than two minutes. There is so much content on the web that it is a struggle to attract and retain readers. Even more difficult is keeping readers interested enough to stay engaged with an article to the end. “So one key question is, how do you make content more engaging?” asked Jonah Berger, Wharton professor of marketing. What choice of words would persuade the reader to keep going? What they discovered was that an article’s readability plays a key role in whether readers stay engaged: Content that is easier to read and understand tends to do better than complicated articles. “The more complex it is on a readability standpoint, the less likely you are to continue reading,” Berger said. “But the more familiar the words, the more concrete the texts are, the more likely you’ll continue reading.” For instance, a sentence that uses the word “orangutan” rather than “ape” could discourage further reading. Another catalyst to reading is emotional content. “Positive emotions lead to more reading and negative emotions also lead to more reading,” Berger said. But there are nuances among types of emotions. For example, fear, anxiety and anger lead to more reading. But sadness leads to less reading. “Not all negative emotions have the same impact,” he added. How about the choice of topic versus style of writing? Which one would make people read further? Berger said the topic by itself doesn’t necessarily indicate whether people will read more, or less. For instance, it’s not a given that when one writes about celebrities, more readers will flock to the article rather than to a story about politics. “You’re not stuck,” he said. Rather, “the way you write those articles can have a similar impact in terms of whether people continue reading them or not” on average. There is no shortage of reviews on the internet. Across Amazon, Yelp and TripAdvisor alone, there are half a billion reviews from people opining on such things as books, restaurants and hotels. Positive reviews are coveted. “Marketers care about this text, and they often put a premium on both measuring and maximizing this positivity,” said Matthew Rocklage, visiting assistant professor of marketing at Northeastern University. But will these positive reviews actually lead to increased business? To get around the positivity problem, they created a new indicator called “Evaluative Lexicon.” It analyzes words and measures their emotional level on a mass scale. “It is, at its heart, a sentiment analysis tool but with a very special focus on the extent to which that sentiment is based on an emotional reaction versus a less emotional reaction,” Rocklage said. Rocklage and his team studied online reviews on Yelp of all Chicago restaurants rated three or more stars by diners. They took the first 20 reviews and ran them through the Evaluative Lexicon tool. Their measure of success was the number of daily reservations a restaurant would get over a two-month period. They found out that “the more emotional the first 20 reviews, the more table reservations were made at that restaurant later,” Rocklage said. “This was above and beyond the average star rating,” which was less of a predictor of business growth. As such, positive ratings “tend to be an unreliable predictor of future success, whereas emotionality is … this nice signal,” he said.